Tonight I found William Barnes's will, he died 1935. 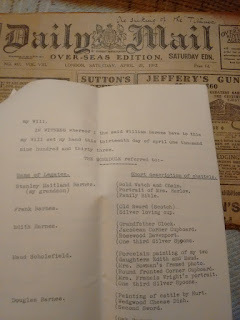 I have been looking for it for ages (for another reason) and had searched my Barnes/Ashbourne boxes a number of times. I suddenly remembered that it came from the USA cousins and had remained filed in that box. WB had left specific legacies of personal chattels to sons (or their issue) who had emigrated to Canada and USA. A portrait of "Mrs Harlow" to his grandson Stanley Maitland Barnes. I already told you that when Stanley's widow died a few years ago and the house was sold and cleared the family decided not to keep the portrait, but later when they saw the copy of the portrait still in possession of the Harlow family in Devon, and my own photo images by Robert Bull, per images below, they realised who it was. 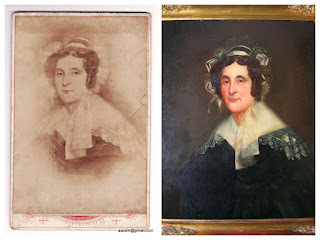 This is another piece of evidence that it is Amelia Harlow nee Wyatt 1783-1853, wife of Robert Harlow.